but those are my only positive thoughts. What we have is a crunchy cone filled with bright white fluffy 'stuff' that is cold like ice cream but will satisfy very little of your craving for ice cream. It's a shame really. 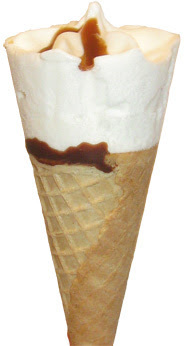 Skinny Cow is owned by Nestle, and it sure seems like they are using Drumstick technology to create a crunchy cone, but why waste this effort on such a flavorless filling. Seriously, it's not like vanilla flavor adds calories, and they aren't even using real vanilla, so you can't blame it on cost either. I guess I just don't get it, what's the point? On Second Scoop: Yeah, I definitely won't buy these boring things again. The only excitement I found was that the last one had an oversized lump of chocolate in the bottom of the cone - tasted like a chocolate chip cookie.